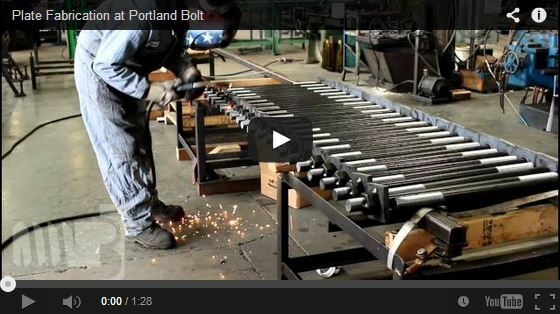 While Portland Bolt primarily manufactures custom bolts and rods, we also have the equipment and personnel to perform plate fabrication and welding. Square and rectangular plates are often used as washers or anchor plates with bolts being embedded into concrete. 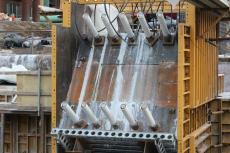 Rectangular plates can also be welded together to form anchor bolt templates. Portland Bolt has a 120 ton and a 150 ton Uni-Hydro Ironworker capable of shearing and punching holes in A36 flat bar and angle up to 1” thick. Purchasing the plates from the same vendor as the anchor bolts is a convenient option for our customers, even more so if they need to be hot-dip galvanized, which we do right here in our 85,000 square foot manufacturing and hot-dip galvanizing facility. Our certified welders perform operations such as welding plates to nuts, nuts to rods, or any other requirements that you may have. Portland Bolt’s ability to carry out these fabrication operations is an example of the broad range of manufacturing capabilities and value-added services we provide to help ensure your project stays on schedule. 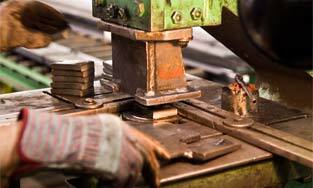 For your next project that requires special washers or plates, contact Portland Bolt. In a city known as “Bridgetown” due to the eight bridges connecting the east and west sides of Portland, Oregon, the Sellwood Bridge was considered the least safe bridge in the city. In 2013, new construction began on a replacement bridge over the Willamette River. Portland Bolt manufactured massive 4 inch diameter by 20 feet long high strength anchor rods for this replacement bridge. Learn more. Q: Which grades of nuts are weldable?A: Most nuts, even low strength nuts, are not weldable. Does this answer surprise you? 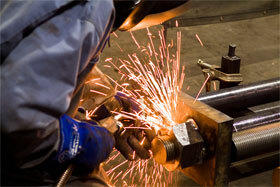 Welding of nuts to threaded rods and nuts to steel plates is a common industry practice. We often see engineers design fasteners, especially anchor rods, that have nuts welded to the embedded end of an anchor rod to provide pull-out resistance. Perhaps a more structurally sound alternative to consider is the use of a headed anchor bolt with a forged head in lieu of a welded nut. If the nut is welded to an anchor plate and assembled to the embedded end of an anchor rod, an alternative that avoids welding would be to sandwich the anchor plate between two nuts. Learn more about why most nuts are not weldable and possible alternative designs to consider. Portland Bolt has designed several useful tools and calculators that will save time and improve accuracy. Best of all, they’re free to use! Check them out below. This handy tool calculates the length of individual rods within a tie rod assembly when given a pin-to-pin dimension. Works for tie rods with and without turnbuckles. 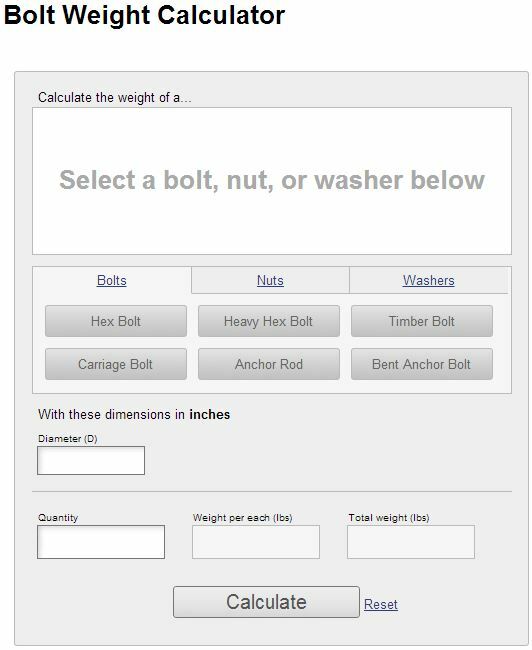 Used as an aid to help estimate the weight of bolts, nuts, and washers. Various types of bolts are available including headed bolts, straight rods, and bent anchor bolts. 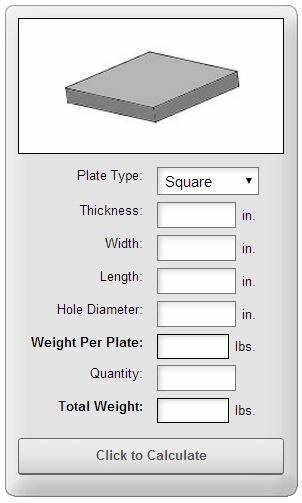 Use this free tool to easily estimate the weight of carbon steel plates. Whether your plates are round or square, it will automatically account for plates with or without holes. Simply enter the dimension and quantity to get the individual plate weight and total weight.